TABLE MANNERS IN TRIBECA, a Short Play by William Ivor Fowkes, was presented at Cone Man Running Productions' 2016 Five Minute Mile Festival at Obsidian Theatre, Houston, TX. This play was first produced in 2010 at the Turtle Shell Theater in New York City. How to handle an ex-boyfriend who tries to come between you and your date. SYNOPSIS: In the beginning there was . . .the spin. Despite his calm exterior and reassurances that everything is fine, Public Relations Executive Trevor Greystone's life is spinning out of control. Fortunately he has a plan, if an odd one, to free himself from his past and make amends for some of the lies he has committed. "WE'RE BACK IN STUDIO, Thurs. July 14th (Bastille Day!) recording a new two-actor, one act play from New York playwright, William Ivor Fowkes. 'THE NEXT MOVE' is a provocative and at times deeply disturbing study of a couple in their sunset years. He's a retired university Dean; she's his dementia-plagued wife. The underlying diagnosis may very well be a lifetime of unrelenting emptiness. The couple share a hole in their hearts that can never be filled, certainly not by the history of dinner and Bridge guests who, as well, have long since dropped off their Day Planners. 'THE NEXT MOVE' stars Petaluma Radio Players Tom Wilson and Linda Jay. The event marks Linda's debut on the acting side of the mic." SYNOPSIS: It's the Year of Our Lord 1999. Retired gay men flock to the Sunshine Quest Club in Fort Lauderdale, Florida, for dancing, companionship, flirtation, and nonstop fun. But not everyone is waiting for them with open arms. Infinity Stage - licensing information. Production of Film Version of THE BRAZILIAN DILEMMA Begins. 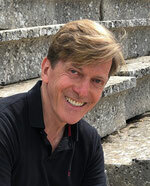 The Collective NY is producing a film version of THE BRAZILIAN DILEMMA, a short play by William Ivor Fowkes. Production occured in Manhattan in June. It was directed by Timothy Naylor, produced by Pulkit Datta, and starred Karen Chamberlain and Robert Z. Grant. This play was originally produced by The Collective NY, October 2013 (and again December 2015) and also starred Karen Chamberlain and Robert Z. Grant. The film was edited over the summer. SYNOPSIS: Peter & Janine have finally said the "L word." But what about the third person in their bed? A One-Act Play by William Ivor Fowkes was presented at the Black Box Festival, Gallery Players, Brooklyn, NY, June 16-19, 2016. SYNOPSIS: Marjorie Mumford argues with her daughter while fretting over the preparations for her husband's 72nd birthday party at their apartment at The Dakota, but what 's really worrying her is the absence of the birthday boy. MANHATTĀNIA, a Comedy by William Ivor Fowkes, has been licensed by COMEDY PLAYS U.K., a licensor of comedies based in England. A reading of this play was presented by Sundog Theatre, Staten Island, NY, in October 2015. SYNOPSIS. Four tales of ordinary New Yorkers making unexpected connections: A man muddles through therapy in THE SESSION. Two women fight for survival on the street in NOT HERE YET. A recluse finally seeks company in THE DAKOTA. Three visitors spend an upsetting afternoon at the Museum of Modern Art in MUSEUM PIECE. MUSEUM LOVERS, a Gallery of Portraits by William Ivor Fowkes, was named a SEMIFINALIST for Inkslingers, Southeastern Louisiana University, Baton Rouge, LA. SYNOPSIS: In this comic celebration of the joys and pitfalls of visiting art museums, two art lovers, Max and Chloe, meet, fall in love, get married, honeymoon, break up, and ultimately find a different kind of happiness--all at the museum. Weaving through the story are sketches of museumgoers reacting to a variety of works of art, ranging from conceptual art to oversized outdoor sculpture, paintings by Monet, Velazquez, Raphael, Goya, and others--and a controversial work called, "Door with Purple Line." AN ACCIDENT IN THE PARK, a one-act play by William Ivor Fowkes, has been given the distinction of HONORABLE MENTION by the New Voice Play Festival, The Old Opera House Theatre Company, Charles Town, WV. This play will have its world premiere at the Gallery Players, Brooklyn, June 16-19, 2016. Performances: Thurs 4/14 @ 7:30pm; Fri 4/15 @ 7:30pm; Sat 4/16 @ 8pm; Sun 4/17 @2pm; Fri 4/22 @ 7:30pm; Sat 4/23 @ 8pm. LOCATION: Black Box Theatre, Grunin Center, Building #11 on OCC's Main Campus, College Drive, Toms River, NJ. TABLE MANNERS IN GRAMERCY PARK, a short play by William Ivor Fowkes, is going to be published in Smith & Kraus's volume of 105 FIVE-MINUTE PLAYS FOR STUDY AND PERFORMANCE. In this play, a man tries to prevent a woman from dropping him. A Very Short Play in Print. AMOEBAS, a one-minute play by William Fowkes (which appeared in Fast & Furious III at Stage Left Theater in Spokane, WA, January 2016) will be published in the spring 2016 edition of DOOR IS A JAR MAGAZINE, a bi-annual online and print publication. Broadcast of TABLE MANNERS IN SANTA MONICA. Click for info on availability on Shoestring Radio Theatre and how to listen. A collection of 19 short stories by William Fowkes. 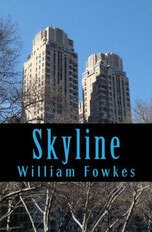 "In SKYLINE: TALES OF MANHATTAN, award-winning playwright and author William Fowkes presents stories of New Yorkers—gay, straight, and confused—making startling connections and discoveries. On the West Side, a man approaching his 60th birthday tries a new haircut, with disastrous consequences. On the East Side, a Park Avenue Republican gets a taste of life on the "down low" in Central Park. In the East Village, a struggling writer papers his kitchen wall with rejection letters. In SoHo, a graphic designer takes drastic steps to get the attention of her editor. At MOMA, a woman physically attacks a man examining a sculpture she doesn't like. Downtown, a transplanted New Orleans cabaret singer deals with life and love in the aftermath of 9/11. There are 19 stories in all—enough to demonstrate that Manhattan's residents are just as striking as the city's celebrated skyline." A Very Short Play in Spokane. AMOEBAS, a one-minute play by William Fowkes, appeared in Fast & Furious III at Stage Left Theater in Spokane, WA, January 30-31, 2016.